A U.S. citizen who had been held in Syria by the regime of Bashar al Assad for nearly three years was killed in its custody, according to a human rights group and the State Department. Layla Shwekani, who was born and spent her early years in Damascus, but lived in the Chicago suburbs, was a "humanitarian activist," according to the Syrian Network for Human Rights. She had returned to Syria in 2015 and was detained in February 2016 by regime forces. "She was registered in civil registry department as dead in December 28, 2016, we believe she was executed in Saydnaya military prison in Damascus Suburbs governate," the group wrote in a newly released report. Shwekani was born in 1990 and held a degree in information architecture from Arab International University in Daraa, Syria. 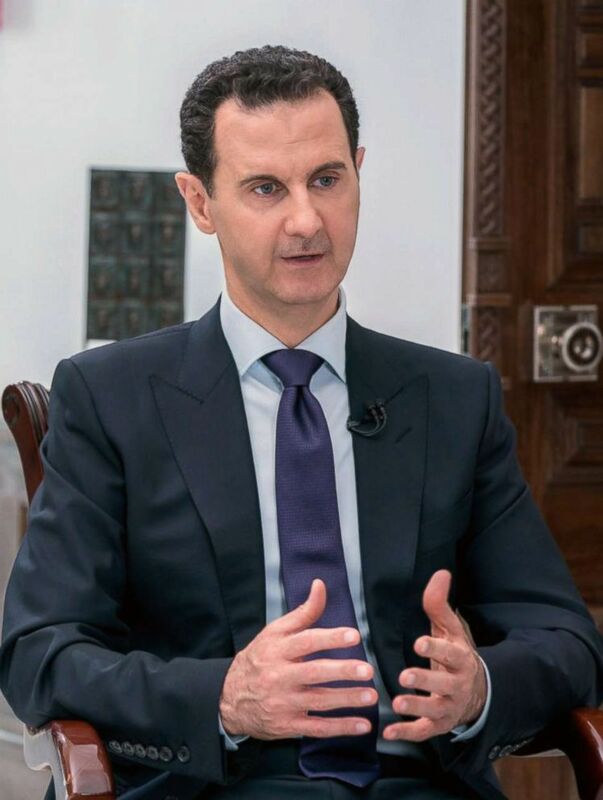 Syrian President Bashar al-Assad is pictured giving an interview to a journalist from Russia Today in the Damascus, in a handout picture released by the official Telegram page of the Syrian Presidency on May 31, 2018. The report, released Dec. 2, details 15 people killed by torture in Syria in November. The State Department confirmed to ABC News that they're "aware of reports of the death of a U.S. citizen in Syrian regime custody," but they declined to comment further because of privacy. Her local mosque in Willowbrook, Illinois, said they held a funeral prayer for her last Friday after the family recently found out she was killed, according to the local Chicago CBS affiliate, adding that her family declined to be interviewed. The Syrian civil war has claimed more than 500,000 lives, according to monitoring groups. An additional 60,000 people have gone missing since the war began, according to the International Commission on Missing Persons. The U.S. has accused Assad's regime of war crimes from torture and extrajudicial killings to the use of crematoriums and chemical weapons, but it no longer calls for his immediate removal. Instead, the Trump administration has expressed its desire that a political transition to take place. Releasing information has been a common practice by the Assad regime more recently -- as the war's battlefields quiet down, it has started to issue death notices for political prisoners it executed in an effort to resolve the cases of thousands of missing Syrians.